Many times I wondered when they took my daddy down. Will he come back to me? Will they leave him in the ground? The Foghorn Stringband is the present day shining gold standard for American string band music, with eight albums, thousands of shows, over a decade of touring under their belts, and an entirely new generation of old-time musicians following their lead. Through all this, they’ve never let the music grow cold; instead they’ve been steadily proving that American roots music is a never-ending well of inspiration. The music of The Foghorn Stringband today, as heard on their new album Devil In The Seat, revolves around four master musicians: Portland, Oregon-based Caleb Klauder (vocals, mandolin, fiddle) and Reeb Willms (vocals, guitar), and Yukon-based Nadine Landry (vocals, upright bass) and Stephen ‘Sammy’ Lind (vocals, fiddle, banjo). Each member of The Foghorn Stringband comes not only from a different part of the American roots music spectrum, but leads the pack in their field as well. Caleb Klauder’s wistful, keening vocals and rapid-fire mandolin picking are as influenced by Southern roots music as much as by his upbringing in Washington State. Also from Washington, Reeb Willms grew up in the state’s Eastern farmlands singing hard-bitten honky-tonk with her family. Nadine Landry’s roots lie in the rural backroads of Acadian Québec, but she cut her teeth as one of the best bluegrass bassists in Western Canada. Minnesotan Stephen ‘Sammy’ Lind, simply put, is one of the best old-time fiddlers of his generation and has a voice that sounds like it’s coming from an old 78. Onstage, The Foghorn Stringband gather around one microphone, balancing their music on the fly, and playing with an intense, fiery abandon. To make their new album, Devil in the Seat, the band retreated to the island paradise of Kauai, where, surrounded by coconut palms, beachside views and margaritas, they blazed through a set of old favorites and new discoveries. The music on Devil in the Seat reaches from roots in Appalachia, like Clyde Davenport’s fiddle tune “Lost Gal,” the old square dance song “Stillhouse,” or “Mining Camp Blues” which comes from their friend Alice Gerrard, all the way to the early neon lights of Nashville (“90 Miles an Hour” from Hank Snow). It touches on old gospel (“Longing for A Home” from The Cooke Duet), newly composed fiddle tunes (“Jailbreak”), even British folk (“What Will We Do”). 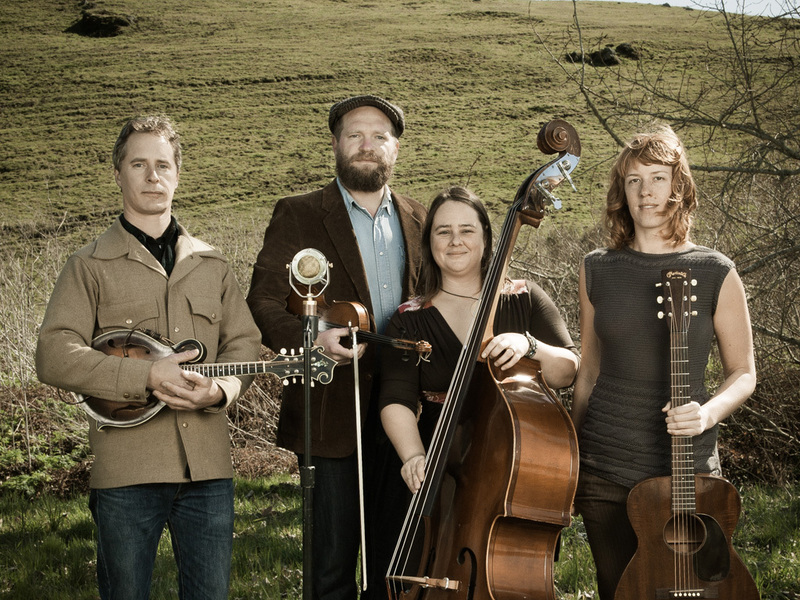 Throughout, the honest intensity of the music remains the trademark of The Foghorn Stringband. They see no reason to polish this music, or to deviate from the roots which first inspired them. To Foghorn, this music is as relevant today as it was a century ago. They see themselves not as revivalists, but as curators and ardent fans, and their music is a celebration of these roots. From their origins in Portland Oregon’s underground roots music scene in the late 90s and early 00s, when members of today’s hot bands like The Decemberists and Blind Pilot were gathering to explore the roots of American folk music, The Foghorn Stringband have spread the old-time string band gospel all over the world. Along the way, they’ve brought in influences and inspirations from their many travels and late-night jam sessions. Old-time square dance tunes now rub shoulders with Cajun waltzes, vintage honky-tonk songs, and pre-bluegrass picking. This is the kind of bubbling musical brew which first intoxicated the American mainstream in the days when “country music” was just being invented.